With the Huawei P30 and P30 Pro just around the corner, a new report which contains quite a bit of information about the devices has just been published. Although, as usual, it's worth taking the info with a pinch of salt just in case. Kicking things off with the Huawei P30 Pro, it’s claimed once again that it’ll adopt an OLED display just like last year’s P20 Pro. 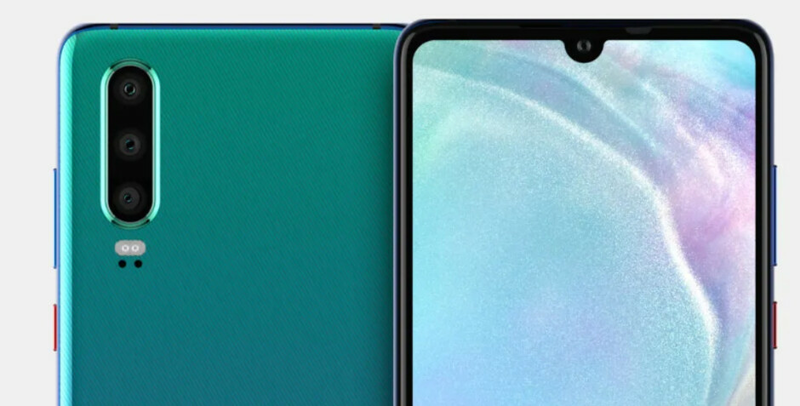 This time around, though, the panel is set to resemble that of the Huawei Mate 20 Pro with curved edges on either side. Additionally, the report points toward a large 6.5-inch display that’ll put the device on par with Apple’s iPhone XS Max. The Huawei P30, on the other hand, is also set to adopt an OLED display. This is a first for Huawei as it usually reserves LCD panels for these offerings. Nevertheless, unlike its premium sibling, no curved edges are to be expected. The device’s display is also said to be slightly smaller at 6.1-inches. Size-wise, the Huawei P30 Pro is compared to last year’s Huawei Mate 20 Pro while the Huawei P30 is reportedly no bigger than the Huawei P20 that it succeeds. These dimensions are achieved primarily by a combination of slimmer top and bottom bezels. 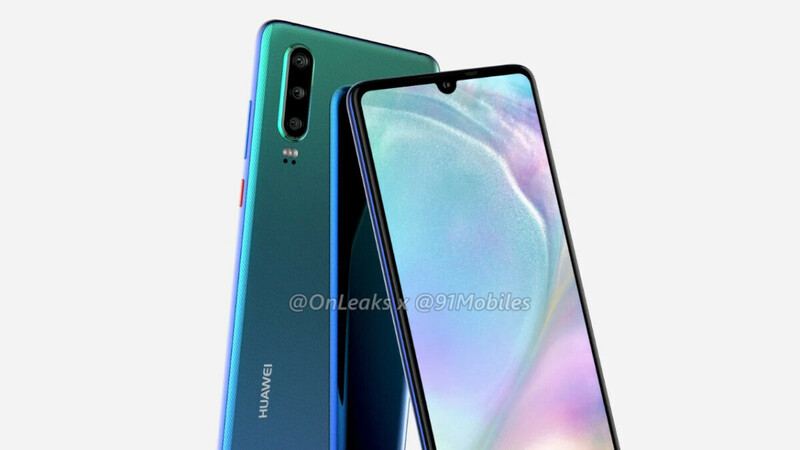 However, Huawei is also said to have adopted waterdrop notches on its upcoming flagship series, a detail that coincides with a previous set of renders. In fact, it is because of this that company has allegedly chosen skip the facial recognition technology it introduced on the Mate 20 Pro. Instead, the Chinese brand is said to be relying solely on in-display fingerprint scanners. It remains unclear if these are optical or ultrasonic sensors, though. Taking a look at the rear of each device, the report suggests Huawei will fit the P30 Pro with the Mate 20 Pro’s camera setup. If this is indeed the case, consumers can expect a primary 40-megapixel camera, a 20-megapixel sensor coupled with a wide-angle lens, and a third telephoto alternative that boast an 8-megapixel resolution and supports 3x optical zoom. A dual-tone LED flash and laser autofocus is to be expected also. Together, if this setup is indeed present, the Huawei P30 Pro should be able to produce some pretty impressive images, especially in low-light conditions. Moving on to the larger P30 Pro, the report doesn’t specify the exact number of cameras although previous leaks suggest four will be present on the rear. The wide-angle and telephoto ones are expected to be maintained while the primary camera could be replaced by a new yet-to-be-announced 38-megapixel sensor by Sony. This is expected to bring vast improvements to low-light photography, thus further solidifying Huawei’s position of dominance in the segment. The fourth camera on the Huawei P30 Pro is rumored to be a Time-of-Flight sensor. This is also rumored for Samsung’s 5G Galaxy S10 X and Apple’s iPhone XI. If implemented, the 3D sensor should help produce better bokeh images and could also be useful for potential AR content implementations. On a final note, the report points towards Huawei’s own Kirin 980 inside the duo. This chipset is built on the 7-nanometer process and should be just slightly slower than Qualcomm’s Snapdragon 855 and Apple’s A12 Bionic. The processor will allegedly be paired with 8GB of RAM in the Huawei P30 and a whopping 12GB of RAM in the Pro model. Storage variants remain unclear but Android 9 Pie complete with an updated EMUI 9.1 overlay is to be expected. The Huawei P30 series will most likely go official in late March, just like last year’s Huawei P20 lineup. However, the brand has announced an MWC event so perhaps the flagships will make a surprise appearance earlier on. No sdcard and no 3.5mm. No buy. The leaked photos shows there to be a headphone jack. So there may be some hope for a headphone jack to appear on the final version. Are Huawei good for software updates? They're generally quicker than Samsung. The Mate 20 Pro launched with Pie and the P20/P20 Pro & Mate 10/10 Pro received the update in mid-December. With my experience with previous mate, you get 1 update sooner than Samsung and that is it. No more updates than 1 major update. They update their phones quicker than Samsung and all P and Mate series get minimum of 2 major OS updates and up to 3 years of security patches, apart from those that have "Lite" in their names. The interesting bit here is that smartphone development has plateaued so much that I don't see a single improvement in comparison to the Mate 20 Pro. What exactly will set the P30 series apart from the latest Mates? I think companies would do well to give up the two flagships per year cycle. They should stick with flat displays, we all saw the quality of panels they used on the Mate 20 Pro. The screen on my P20 Pro, and although it isn't the best 1080 AMOLED panel on the market, was hands down much better than the 2k panel on the Mate 20 Pro, no gluegate issues, no banding and uniformity issues, no severe color shifting especially on the sides. The Mate 20X not getting any credit. This thing is a beast!